Ben Winter and Ispo. Photo by Jenni Autry. 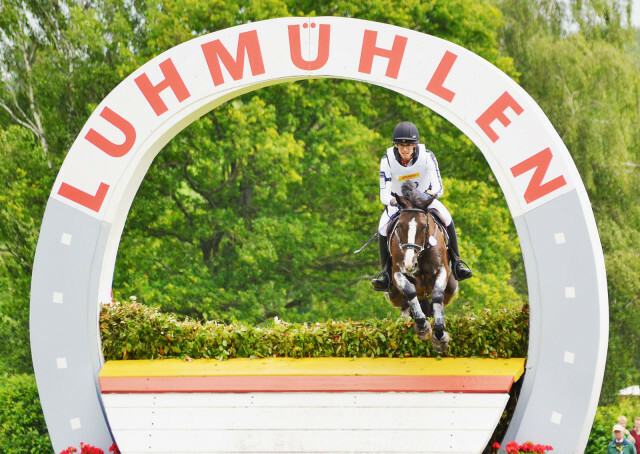 With Rolex recently concluded and Badminton entries finalized, the next four-star that the United States will have riders competing at will be Luhmühlen in June. Currently, both Libby Head and Clark Montgomery plan to compete, and the USEF grant application for this event has been extended to May 4. While last year’s edition of Luhmühlen was very successful Boyd Martin and Phillip Dutton, it was completely overcast by the tragedy of Ben Winter’s death on the cross country course. It seems that in response to this incident, Luhmühlen has added additional qualification requirements for participation in the four-star competition. Listed on page 7 of the FEI Approved Schedule for Luhmühlen, the organizers are requiring an additional CCI3* completion for horses ridden by Category C or D (and presumably non-categorized) riders in addition to the FEI requirements. FEI qualifications for the four-star level require at least one CCI3* and one CIC3*, as well as an additional three-star of either type. But those attending Luhmühlen this year who have qualified for a four-star using one CCI3* and two CIC3* need to also have another CCI3* if they are not a Category A or B rider. First, should four-star qualifications be more stringent than they currently are? Using the requirement of an additional CCI3* that Luhmühlen is using, I crunched the numbers from Rolex to see how the field would have fared. Of 75 official entries at Rolex, 16 pairs would not have been permitted to enter Rolex if the additional CCI3* qualification had been required. An additional six pairs would have been borderline, but would have been permitted to enter due to the fact that one of the CCI3* qualifying results may have a stop on cross country. Of the 16 pairs who didn’t have the additional CCI3* qualification, 15 started cross country. Six were eliminated (rider fall or accumulation of refusals), and one retired after refusals. Six had jumping penalties on course but completed. In this category with one CCI3* qualification, only 13.3% (two riders) of those who started cross country completed without jumping penalties. Overall, these pairs had a 50% completion rate for the entire event, and those who finished cross country went on to complete the event. The six borderline pairs with one clear CCI3* qualification and one CCI3* with a stop actually fared more dubiously. Two of these pairs were eliminated on cross country, and another retired after stops. Of the three pairs who completed the cross country, one was clear but withdrew before stadium, while the other two had jump penalties. One of those pairs was then eliminated in the show jumping. This category had a 16.7% completion rate and a 16.7% rate of finishing the cross country clear of jumping faults. To compare, the 53 remaining pairs were fully qualified under Luhmühlen’s requirements. Fifty pairs started cross country in this category, and 70% of them finished the course. Only five riders (10%) of those who completed had any jump penalties (frangible or otherwise) on the course. A whopping 60% of this category who started cross country finished the course without any jump faults. The overall completion rate for the event was 58.49%, though an additional 7.55% of the rides finished the cross country but withdrew prior to the final jog. It’s clear that the extra CCI3* qualification may serve as a barometer for performance in a CCI4*. A majority of the riders with at least two clear CCI3* performances under their belt had no difficulties with the course, while those with only one clear completion struggled across the board. Does that mean the FEI qualifications for a CCI4* should be strengthened? It’s certainly something that the FEI might make note of if the results from Rolex are any indication. It should be noted that Ben Winter would still have been permitted to compete at Luhmühlen last year with Ispo, as he had two CCI3* completions with the horse. One of those CCI3* had a stop though, putting him in the borderline category, which actually performed worse at Rolex than those who did not have the additional qualification. The second question that this situation asks is the more insidious of the two. Luhmühlen has enacted additional qualifications that are necessary to compete at their CCI4*. Can events now create additional rules that must be followed in order to participate? In a review of the FEI eventing rules, Article 504 dictates participation restrictions. Nowhere in this article does it specify whether or not organizing committees are permitted to enact additional qualification requirements for their event. In fact, there are only two situations in which organizers may limit horses, either with a balloting procedure as is done for Badminton (which accepts entries based on FEI points), or by only allowing two horses per rider should the event be overdrawn (which is required). Article 509 discusses entries, with 509.1 stating that “entries must be made by the National Federations according to the conditions published by the Organizing Committee in the approved schedule of the Competition.” This may be the best indicator that organizing committees are empowered to enact additional restrictions on their event if they so choose. However, 509.3 seems to negate that with the Certificate of Capability. This certificate is what the National Federations are required to send to the organizing committee that each athlete combination has achieved national requirements as well as FEI requirements for said event. Nothing is mentioned of achieving additional qualifications required by the committee. Allowing events to dictate additional requirements is a slippery slope. It may start with the best of intentions, and requiring riders to be overly qualified is certainly an admirable goal in the march towards improving safety. However, what begins with qualifications may turn into more frivolous demands. If Luhmühlen wishes to limit their entries — whether in the name of safety or otherwise — a better method would likely be to adopt a balloting procedure such as Badminton’s. What do you think, EN? Should events be able to enact their own rules beyond the FEI’s rules? Should the FEI require more stringent qualifications to compete in a CCI4*? Weigh in with a comment below.